There are four kinds of fire detectors that your fire protection partner can advise you about. Every business needs the best fire protection possible. There are four kinds of fire detectors that your fire protection partner can advise you about. Heat and smoke are two of the main components of a fire, and part of what makes the fire so dangerous. That’s why you need to know whenever one breaks out in your business. Ionization fire detectors activate whenever they detect the presence of smoke. These detectors feature two metal plates inside them that have an electrical current flowing back and forth. When smoke reaches the chamber, it cuts off the current, which cues the alarm. Ionization-based detectors are best used in places where quickly burning fires, such as commercial kitchens, can happen. Photoelectric fire detectors are similar to their ionized counterparts. However, they rely on light instead of an electric current. Smoke entering the chamber on these units disrupt the beams of light that these detectors project. Whenever this happens, the alarm activates. Photoelectric fire detectors have two useful advantages over ionization-based detectors; they can identify smaller fires and are also less likely to trigger a false alarm. While everyone understands how dangerous a raging fire is, it’s not always the flames themselves that are the most hazardous. Heat presents a problem as well because intense heat can cause a fire to spread. 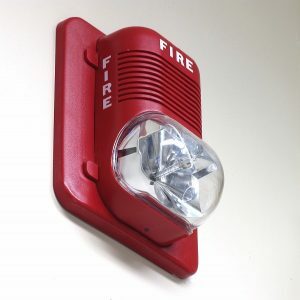 Heat can also cause fire alarms to occur more often. Heat-based fire detectors are not as sensitive as the other fire detectors commonly used in commercial facilities. This can be a benefit and a drawback, particularly in buildings where excessive levels of steam, dust, and humidity are the norm. Instead, these detectors are better-suited for buildings that don’t see human activity as often, such as warehouses and other storage facilities. Sometimes, two types of fire detector are better than one. Fortunately, ionization and photoelectric detectors can be built into the same unit. These detectors track the amount of smoke in your building and will activate when the smoke buildup is too high. However, they won’t activate if it gets too hot, as they lack heat sensors. This entry was posted on Thursday, November 29th, 2018 at 2:51 pm. Both comments and pings are currently closed.